Dan, an Irishman who's ended up in New Jersey, finds himself embroiled in a world of murder, kidnapping and corrupt cops. Dan works as a bouncer in a seedy club, half in love with hostess Connie. When Connie is murdered on the premises, a vengeful Dan finds himself embroiled in an increasingly deadly sequence of events in which his doctor friend Zeb goes mysteriously missing, a cop-killing female cop becomes his only ally, and he makes an enemy of ruthless drug-dealer Mike Madden. 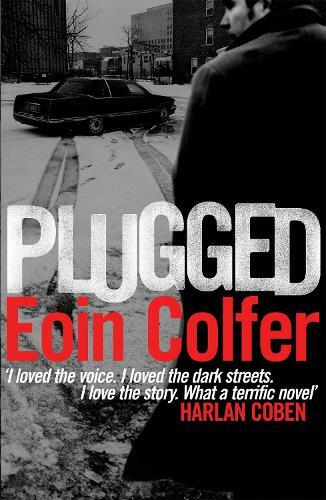 Written with the warmth and wit that make the Artemis Fowl novels so irresistible, though with additional torture and violence, PLUGGED is a brilliant crime debut from a naturally gifted writer with a huge fanbase. Eoin Colfer is an Irish novelist. He was a primary school teacher before the huge success of the Artemis Fowl series of books, about a young and brilliant teenage criminal mastermind. The series was popular throughout the world, reaching the top of the New York Times bestseller list numerous times--it enabled him to retire from teaching to write full-time.